Happy Holidays from all of us at FruitFast. We are fortunate to live in a place that is not only ideal for growing fruits like Montmorency tart cherries, but is also blessed with great people, beautiful scenery and vibrant communities. With the holiday season upon us, we thought we would share a little bit of northern Michigan with all of you. Our 10 Holiday Activities – in no particular order – are below. If you live nearby, we hope you’ll enjoy these suggestions with friends and family. If you’re across the country (or even further), give us your impressions of our northern home in the comments. Happy Holidays! 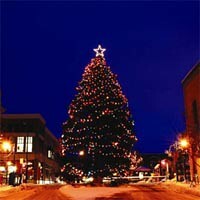 The Christmas tree in downtown Traverse City. Gather everyone in your family/group together and hop in the car – or two vehicles if necessary. Put some Christmas music on the stereo and drive slowly through the neighborhood admiring the Christmas lights. If you know of a house that does a little extra (or a LOT extra), which can be found in most communities, pull over and allow for a little extra viewing time. If you’re close to downtown Traverse City, don’t miss the traditional Christmas tree at the intersection of Front and Cass streets. Home to the internationally-known North American VASA cross-country ski race each winter, the VASA Trail winds its way through the hills and valleys east of Traverse City, offering cross-country skiers over 20 miles of groomed trail and beautiful scenery. If you grew up in northwest Michigan, there’s a good chance you went to the State Theater in downtown Traverse City to see a movie or two during your Christmas break from school. Re-live fond memories and create new ones at this completely renovated, classic movie house. Christmas Eve screenings of It’s a Wonderful Life and White Christmas are sure to inspire the Christmas spirit in even the biggest Scrooge. Read the holiday schedule at the State. Whether you’re picking up a few last-minute gifts on Christmas Eve or browsing the windows with a peppermint mocha, northwest Michigan’s downtowns are perfect for holiday shopping. Quaint waterfront villages like Leland and Suttons Bay are popular stops, as is Traverse City’s vibrant downtown, which offers special evenings for Men’s Night and Women’s Night during the holiday shopping season. Connect directly with childhood holiday memories by grabbing a sled and heading to the nearest sledding hill. If you still have your Flexible Flyer in the rafters of the garage, pull it down and show the kids what sledding was like in the time of A Christmas Story. It’s no coincidence that Michigan has developed a reputation as the “Great Beer State,” and the Grand Traverse region is a big contributor. Enjoy hand-crafted brews at brew pubs and restaurants throughout the area, including Short’s Brewing Company in Bellaire and Jolly Pumpkin on Old Mission Peninsula. Downtown Traverse City offers three options: Right Brain Brewery, Mackinaw Brewing Company, and North Peak Brewing Company. Snowshoeing at Sleeping Bear Dunes National Lakeshore. Snowshoeing is high on our list of winter activities for a number of reasons. It’s an opportunity to burn some calories, it’s relatively easy and requires no instruction (outside of putting on the snowshoes), and most importantly… it’s fun! The 70,000-acre Sleeping Bear Dunes National Lakeshore offers virtually limitless opportunities to explore the outdoors during the winter, many of which offer stunning views from bluffs high above Lake Michigan. Join a ranger-guided snowshoe hike, held on Saturdays during the winter beginning January 7, 2012, and enjoy the natural setting. Michigan tart cherries aren’t the only fruit that thrives on the rolling hillsides of northern Michigan. Wine grapes have become a significant part of the agriculture in the area, and now support a thriving wine region with over 30 wineries between the Leelanau and Old Mission peninsulas. Wind through country lanes and historic farms between tasting rooms at Leelanau Peninsula Wineries, or explore the narrow finger of land between East and West Grand Traverse Bays as you visit the Wineries of Old Mission Peninsula. Northwest Michigan is home to some of the best skiing & snowboarding in the Midwest, averaging over 150″ of lake-effect snow per year in many areas. Get the kids bundled up and hit the slopes at Crystal Mountain Resort & Spa, west of Traverse City, Holiday Hills in Traverse City, or Shanty Creek Resort, near Bellaire. Further up the road are Boyne Mountain, Boyne Highlands or Nubs Nob near Petoskey and Harbor Springs. Ring in the New Year in downtown Traverse City. Happy 2012! In 2009, Traverse City “dropped” a new holiday tradition on northwest Michigan: The Cherry-T Ball Drop. Drawing inspiration from its larger cousin in Times Square, this now-annual event attracts thousands to downtown Traverse City to watch as a giant electric cherry is “dropped” to celebrate the beginning of a new year. Come early and start the celebration at one (or more) of TC’s bounty of restaurants, bars and breweries. Happy New Year! Learn to cross-country ski or snowshoe for free at several participating resorts and trail systems. Billed as the ultimate “Celebration of Wine, Women and Chocolate,” this popular annual event for women focuses on outdoor winter sports, and of course, fun! Craft brews and live music at historic Grand Traverse Commons. An annual celebration of winter over President’s Day Weekend. Wherever you are celebrating this year, all of us at FruitFast hope you enjoy the holiday season with friends and family, and wish you happy, healthy New Year! Another favorite: the beautiful Christmas Luminaries posted along the sidewalks in downtown neighborhoods Traverse City on Xmas Eve! Great suggestion, Sarah! Happy Holidays to you and yours. On a perfect clear frosty evening rekindle the summertime tradition of bonfires and smores. Absolutely! Just be sure to get bundled up with hats and mittens. Happy Holidays!